Congratulations to Wendy who started her new job this week as an Assistant Professor in the University at Albany. As someone who taught me how to really look at and observe wildlife, I wanted to make her something unique for this special day. 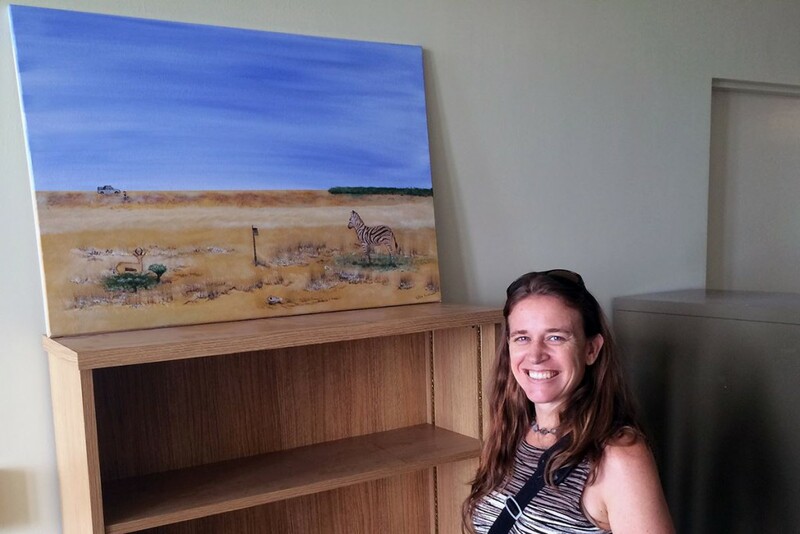 This painting is my office warming gift for her, and it is titled “Wendy in the field” and depicts her walking to sample her field site. There is also a bit of “science” in this painting. About a year ago – on September 1, 2014 – one of Wendy’s papers was accepted for publication, and a part of that paper is what this painting attempts to show. The scene is set just after the first rains in Etosha National Park. The springbok is browsing in a shrub patch. The zebra is grazing on a green patch where the grass is obviously better quality than everywhere else around. The grass is greener because another zebra had died there (the partial skull) a year or so earlier, and its death has fertilized the soil with nutrients and other deadly organisms. Anthrax had killed that zebra and the bacteria are trying to get its next victim by enticing it with a greener patch in an otherwise parched landscape. 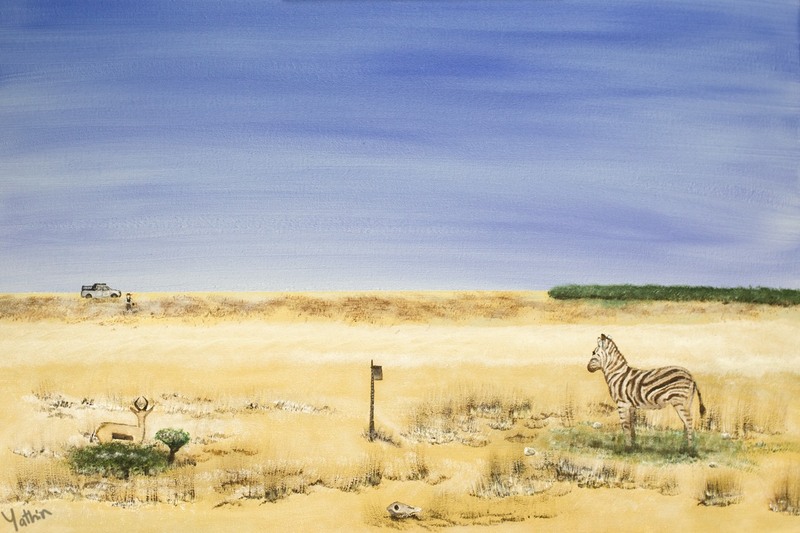 Sub-adult zebras (like the one in the painting) are most susceptible to this “fatal attraction”. The four white stones are placed around the original carcass site and a camera-trap set up to record animal behavior at the site. Over a million photographs from more than a dozen sites were analyzed to find that animals (primarily grazers like zebra) are indeed attracted to such potentially deadly sites. The full paper can be read here. The background with Wendy and the truck depict her typical field visit. Wendy has parked her favorite blue Toyota Hilux “bakkie” along a park road, and has scanned the area for potential danger smile emoticon lions, elephants, rhinos) and has begun walking toward the site. The zebra and springbok have paused their foraging and are alert as they look at the walking researcher. Wendy is wearing her trademark red field hat, and armed with her trusty binoculars as she walks toward her camera-trap site.